Alanya, Alaiye in Turkish history, one of the famous holiday resorts of Antalya region as noted for Turkish Riviera, is located in the southern part of Turkey which has a long and a beautiful coast line of Mediterrenean Sea. 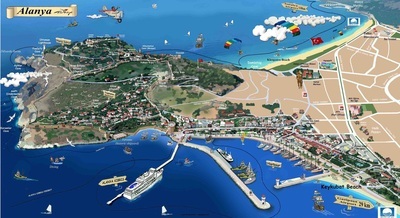 The town is about 135 kms far away from Antalya city center and belongs to Antalya province. Alanya has a great fame among the Europeans due to geographical situation and nice climate so more than fifteen thousands people have already purchased either summer houses or villas to be settled down or to be lived throughout the year. That is why Alanya has become one of the international towns in Mediterrenean coast with mixture of nationalities. Alanya was established on the peninsula which is surrounded by the range of Taurus Mountains with forests in Turkish Riviera boundaries. The neighbors are Manavgat in the south, Gundogmus in the east, Taskent in the north-west and Gazipasa in the South-east. The town has a 70 kms long shoreline in which is availbale for tourism all the year round. Gazipasa airport is very close to Alanya about 30kms so it is very easy to reach Alanya by air from all European destinations and by cruise ships from Mediterrenean ports. 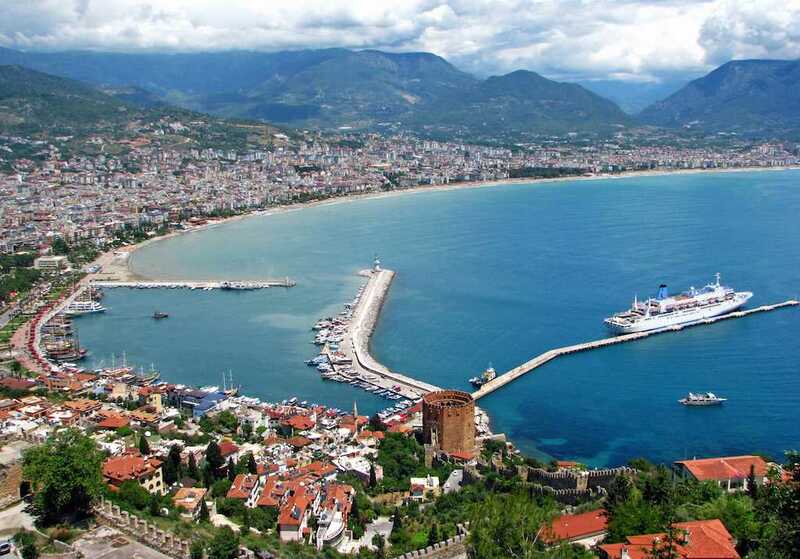 Alanya has a good climate all year round, hot in summer and warm in winter. It is not known yet when it was founded by the first time but in ancient times the area was known either as Pamphylia or Cilicia because of the line between two regions. 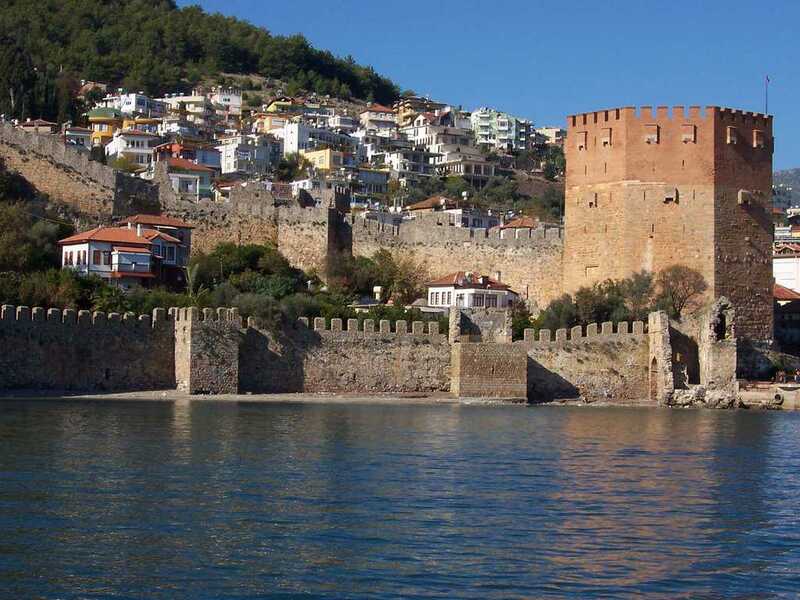 Alanya has been an important military base for Romans, Byzantines, Selçuks and Ottomans throughout its the long history. In Roman times, the town was konwn as Korakesium and it was changed to Kalanoros in Byzantine period. Seljuk Sultan Alaeddin Keykubat wanted to call as “ Alaiye “ when he conquered the town and Alaiye became one of the famous port base of the Seljuk Turks. The sultan also built a shipyard, a fortress , a palace to spend the winter time and a red tower in Alaliye to occupy the whole region. In 1243 Mongols took over the town and later Karamans ruled the town for a short time. When the Seljuk Empire was collapsed down, then Alaiye was sold to Mamluks in price with 5000 golds by Karamans. In 1471 it was added to Ottoman Empire and began used as a navy base. A hundred years later in 1571 Alaiye became a part of Cyprus State, then in 1864 it became the banner of Konya Province and later it was starboard of Antalya and finally in 1871, Alaiye was the district of Antalya city. When Turkish republic was established in 1923, the name was turned into Alanya as the order of Atatürk and became the town of Antalya province. Alanya has a significant share in the country's tourism industry now. 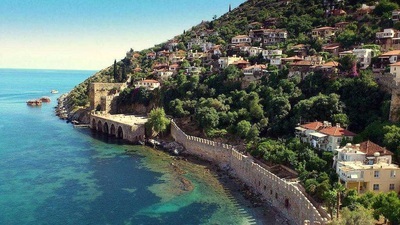 Each year more than five million holiday makers spend their summer holiday in Alanya.It has a big reputation as one of the most famous holidays resorts not only in European countries but also American and Asians. According to the latest census, about fifteen thousands Europeans have been living in Alanya in recent years. The location of the town, the life conditions, the climate and the transport made Alanya worth visiting first and living later. Especially German and Scandinavian people like living and purchasing houses here due to excellent weather and cheap life as well as the famous Turkish hospitality. Although the tourism has a short past and got developed after 1980s, Alanya has an important income source from tourism and has about 200.000 beds which suit to all budgets and the mixture of nationalities.Foreign enterprises are still making investments to enlarge the capasity of hotel beds at the moment. Alanya Castle was built on the peninsula rising up to 250 meters above the sea level and the walls are about seven kms in length with watch towers in each 100 m. The castle was built by the Seljuk Sultan Alaeddin Keykubat whom he conquered the area, changed the name of the town and he rebuilt the whole city beginning with the castle. 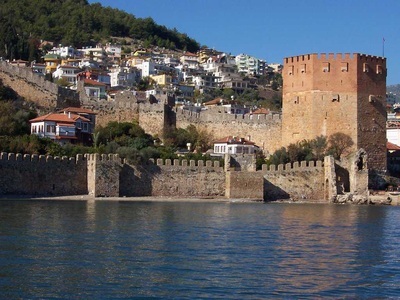 The castle of Alanya is the second biggest castle in Turkey and it has 83 towers and 140 bastions. 400 cisterns, which are embedded in the walls , have been made to provide water requirement of the medieval city and the cisterns are still in use. The castle of Alanya is an open air museum and the tourists who come would like to visit the castle first not only to see the magnificent walls but aslo a splendid view from the towers through the sea. Inside the walls, anyone can see the remains of the cisterns, a church, a mosque, a palace, a bath house and the city walls from here to the Red tower underneath. 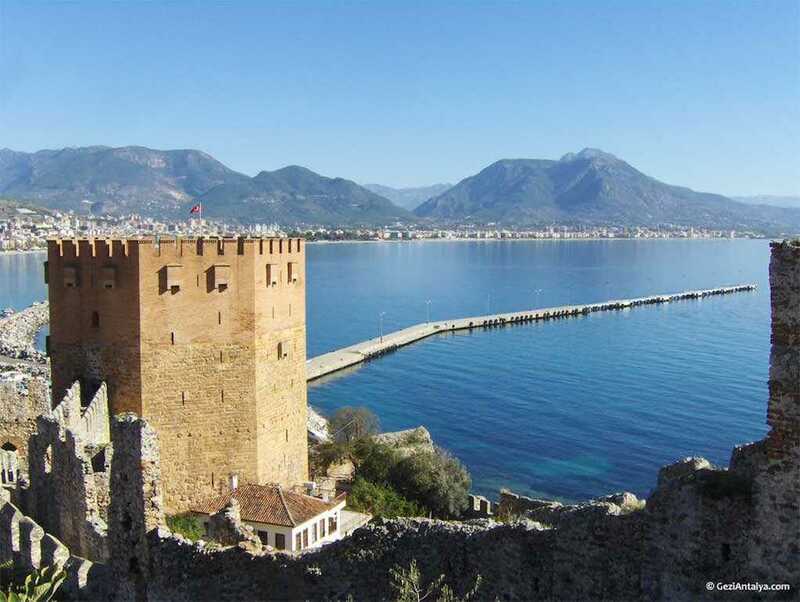 The Red tower is located underneath of Alanya castle and it was built to control the sea traffic of the area. Red Tower construction was completed after 5 years from the conquest of Alanya. Tower has been used for centuries for military purposes against future attacks from the sea port and made to protect the shipyard. Red Tower was built in eight square plan and has 5-storeys, about 33 metres high above the ground. In spite of its splendor look and a huge size, the entrance door of the tower is relatively small. Whoever enters can not pass without tilting his head. 87 stairs can take anyone up to the top in order to see the wonderful scenery of Alanya. Each floor has its own property, to throw some arrows, hot oil spills loopholes and some are decorated with holes in war times. When you reach to the top, you will also see the mouth of the cistern rising since the middle of the ground floor space. There is a door to the castle from the tower. In old times, one could go through in a narrow road safety in the castle until the Sultan palace. The Red Tower was restored in 1948 by Ministry of Culture and Tourism. The sultan Alaeddin Keykubat wanted to be the ruler of the seas so he built the shipyard two years after the conquest of Alanya. In the shipyard, there are five large sections where the war ships are made with a mosque and the soldiers' barracks. The dockyard of five arches were made in order to plan to have the most benefit from daylight. Alanya Shipyard is the first one of Seljuks in the Mediterranean. During the Ottoman period, the shipyard was expanded to build the big war ships and to control the whole area as the important sea base for Mediterrrenean fleet. Arsenal has been made in order to protect the shipyard on a rock 10 meters high from the sea very close to it. It was built in 1227 with three-story rectangular structures of cut stone plan and it is also known that the big balls were spilled for warships. It is about 3kms far away from downtown and is located at the western foot of the peninsula. The cave was found by chance in 1948 during blast of the opening a stove for building the port of Alanya. There is a 50 m passage at the entrance of the cave. After 15 meters in height passage a cylindrical cavity comes which leads to the cave’s floor. It is believed that the stalactite and stalagmites found in crystallized limestone were formed in 15 thousand years. 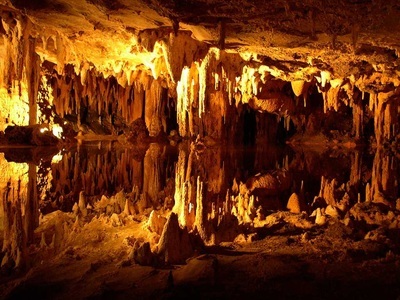 The name is called “ Damlatas “ of the cave because of ongoing water drops dripping from stalactites. The cave has a good reputation among the patients with asthma for its enchanting beauty from good weather. The air of the cave is unchanging in summer and winter, temperature is always 22 Celsius degree, the humidity is 95 percent and the constant pressure is 760 mA. The atmosphere in the cave contains 71 percent nitrogen, 21 percent oxygen, carbon dioxide and 8 percent amount of radioactive ions. A 21-day course of medical treatment under the control of doctors is practised here for the patients who have applied for a certain time sitting in a cave every day. Visitors can pay a little fee for entrance . There are small markets around and The Damlatas cave has a lovely beach front.